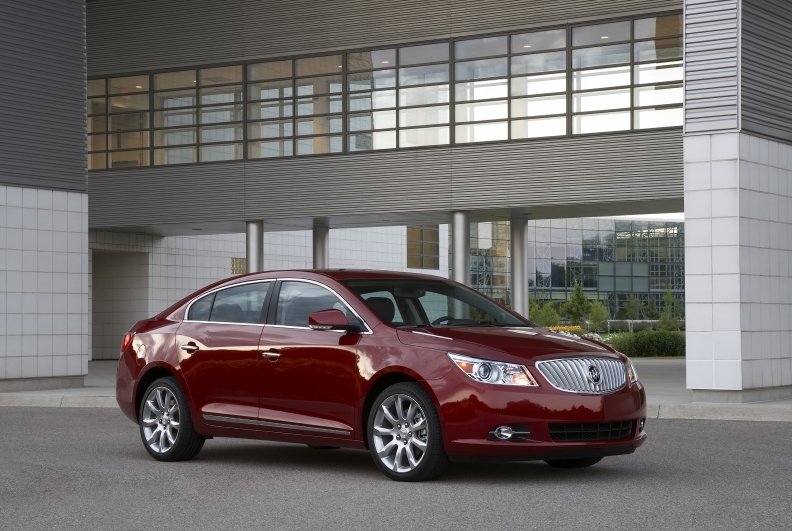 The engines in all of General Motors 2011 cars including this 2011 Buick LaCrosse use a new generation of motor oil. Failure to use the correct oil would void the warranty, GM says. Automakers are going to great lengths to get more miles per gallon from their vehicles and everything is being looked at -- even the engine oil. Every 2011 General Motors car rolls off the assembly line with the engine filled with a new generation of oil. Other automakers, such as Ford Motor Co. and the Chrysler Group, are also beginning the switch to new oil, known by its industry grading as GF-5 or SN, or, in GM's case, Dexos1. GM says using the wrong oil may cause engine damage that would void the powertrain warranty. The grade identifies oil that's designed to help engines run more efficiently and better protect them from wear. Those are key properties as automakers wring more horsepower out of smaller engines and make greater use of heat-producing turbochargers and superchargers. The protection properties of the new oil also have the potential environmental benefit of increasing the mileage interval between recommended oil changes. The Dexos1 and GF-5 oils hit the market on Oct. 1. They replace the GF-4 standard from the International Lubricant Standardization and Approval Committee, which has members from GM, Ford, Chrysler and the Japan Automobile Manufacturers Association. The American Petroleum Institute uses the SN designation for the new oil. “GF-5 and Dexos1 oils have a more robust formulation that should give you better contributions to fuel economy, cleanliness and fuel emissions,” said Mark Ferner, manager of the lubricants technology group at Shell. The main difference between Dexos1, which is a GM-licensed brand, and GF-5 oils is testing, Ferner said. To be certified as GF-5, the oil needs to pass a variety of chemistry and engine tests set by the American Petroleum Institute. But GM's testing for Dexos1 uses some tests mandated by the ACEA, the European automobile manufacturers association, in place of the American Petroleum Institute tests. For example, Dexos1 oil has to pass Mercedes-Benz's sludge and fuel-economy tests and Opel's test for the ability to work under foaming conditions, known as aeration. GF-5-certified oils that do not undergo the same tests are subjected to the American Petroleum Institute's equivalent to be certified. GF-5 oil can be found in both conventional and synthetic formulations but Dexos1 can only be found as a synthetic, according to Shell, maker of the Pennzoil and Quaker State brands. In some cases, oil companies already have formulas that meet or exceed the Dexos1 and GF-5 specifications. For example, Shell's Pennzoil Platinum and Quaker State Ultimate Durability synthetics exceed both standards. Government regulations that call for lower exhaust emissions and higher fuel economy are the drivers behind the new generation of engine oil. GM's powertrain fuel and lubrication engineers began working on Dexos1 in 2006. The goal was to set an oil specification that met the requirements of all GM vehicles and powertrains globally. GM also developed the Dexos2 oil specification for light-duty diesel engines. It was launched in Europe earlier this year. Dexos1 is designed to work with the engine-oil-life monitor in GM cars to increase the mileage between oil changes. “Dexos puts us in a position to try and optimize the drain intervals,” said Eric Johnson, a GM fuel and lubrication engineer who worked on the development of Dexos. GM does not specify a mileage life for Dexos1. It recommends that drivers change the engine oil when the oil-monitor system recommends, as oil life depends on driving conditions. However, Ford says it's possible to go as long as 10,000 miles between oil changes with GF-5 oil. This is possible because Ford has made major improvements in the materials and technologies it uses in its engines, a spokesman said. Among the changes: greater use of aluminum for engine structural components and increasing the size of oil pans. Ford also uses an oil-life-monitoring system, which tells owners when it's time for an oil change. “We have made improvements to our engines and want to use the best oil we can,” spokesman Richard Truett said. Dexos1 and GF-5 oils can be used in older cars. Owners still need to consult their owner's manual to choose oil with the recommended viscosity. Consumers will find some bottles of oil with both the Dexos1 and GF-5 certification, said Ferner of Shell. He added that consumers will not notice an immediate difference after changing to a Dexos1 or GF-5 oil. Instead, the benefits are oil that better protects and cleans the engine over time. But beware if you're tempted to use conventional oil in an engine that calls for the new specification. GM says not using Dexos1 oil may cause engine damage that would void the powertrain warranty. Go to www.gmdexos.com for more information on GM's Dexos oils, and see www.gf-5.com for information on GR-5 oil.